The #2 ranked Men’s Volleyball Team of Concordia University Irvine (CA) defeated #1 ranked Park University (MO) in the NAIA National Invitational National Championship Saturday night, April 20, on the campus of Johnson and Wales. Irvine, CA – The #2 ranked Men’s Volleyball Team of Concordia University Irvine (CA) defeated #1 ranked Park University (MO) in the NAIA National Invitational National Championship Saturday night, April 20, on the campus of Johnson and Wales. The Eagles maintained a perfect weekend, not losing a single set, defeating Park 3-0 (25-22, 25-22, 29-27) to claim the first NAIA National Championship in program history and sixth NAIA National Championship for Concordia – an impressive accomplishment for the Eagles in their first inaugural season. This title marks Concordia’s third National Championship victory in a month, and the fourth in 2012-2103 academic year. The CUI Debate Team won the National Parliamentary Debate Association’s (NPDA) Championship Tournament on March 25, and a student Marketing team from the School of Business and Professional Studies won the Lutheran Church Extension Fund (LCEF) National Student Marketing Competition on April 12. With this latest victory, Concordia captures an NAIA Volleyball championship sweep, as its women’s volleyball team won the NAIA Women’s Volleyball National Championship in December 2012. Concordia did not lose a set all weekend and finished the season 25-7 in the first year in existence. 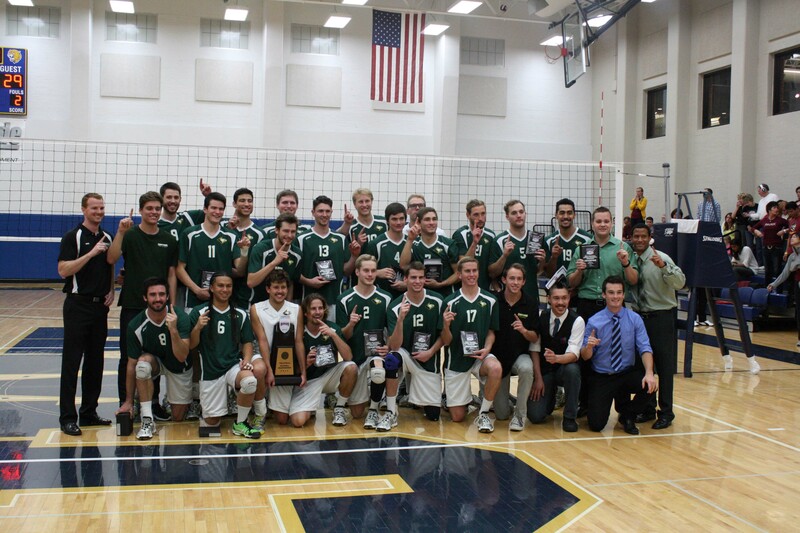 In the program’s first year, the Men’s Volleyball Team claimed the MAMVIC National Conference Championship, the first #1 ranking in school history, and NAIA National Championship. Coach Trevor Johnson was the MAMVIC National Coach of the Year, NAIA Coach of the Year, and All-Tournament coach. Dillon Auxier was the Tournament MVP and All-Tournament selection. Naseri Tumanuvao was the Hitting Percentage Tournament leader and an All-Tournament selection. With the win Concordia earned the sixth national championship in school history (2000 Women’s Cross Country, 2003 Men’s Basketball, 2011 Baseball, 2012 Men’s Basketball, 2012 Women’s Volleyball). The Men’s Volleyball team ends the season with a rock solid foundation for next season, returning everyone in 2014 except senior libero Brad Rostratter. Coach Trevor Johnson will take the reins of the women’s program, but he set his mark in his first and only season with the men. In a season of firsts, everything the team did was a school record, but that bar was set pretty high as Concordia men’s volleyball immediately declared themselves THE national power in the NAIA. Concordia University Irvine is a U.S. News Top Tier Regional University that prepares students for their vocations—their calling in life. CUI offers undergraduate, graduate, and adult degree programs in a beautiful Southern California location, with online and regional cohort options. A member of the Concordia University system of TheLutheran Church – Missouri Synod and guided by the Great Commission of Christ Jesus and the Lutheran Confessions, Concordia University Irvine empowers students through the liberal artsand professional studies for lives of learning, service and leadership. Connect with CUI through its numerous social media channels.